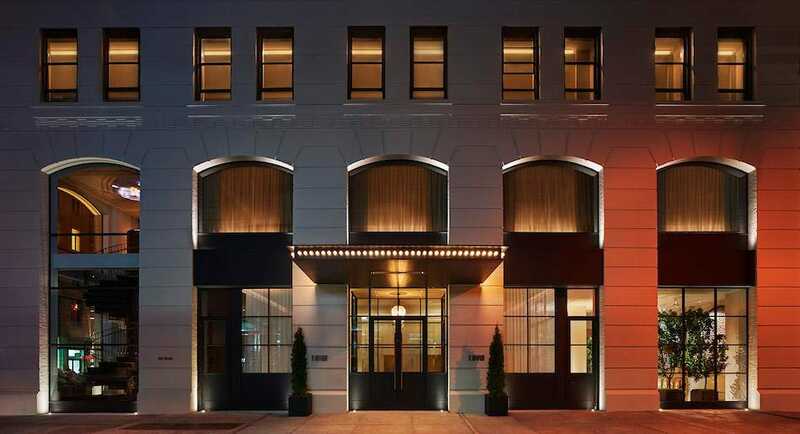 A former Holiday Inn and post office is now a luxury boutique hotel in New York City’s trendy Soho district. The design of 11 Howard could be described as a blend of Scandinavian minimalism and New York edginess. Architect Anda Andrei (well known for her design of Gramercy Park Hotel in New York City and the Sanderson and St Martin’s Lane hotels in London) worked with Space Copenhagen, a Danish interior design firm who recently transformed Arne Jacobsen’s iconic Royal Hotel in Copenhagen for the Radisson Collection. Natural materials and subdued colors have been used throughout 11 Howard and bespoke furniture and carefully chosen art enhance the simple but chic design. I was slightly bemused when, after arriving in what I thought was the lobby, I was greeted by a friendly employee with an iPad who then proceeded to show me how to check in. 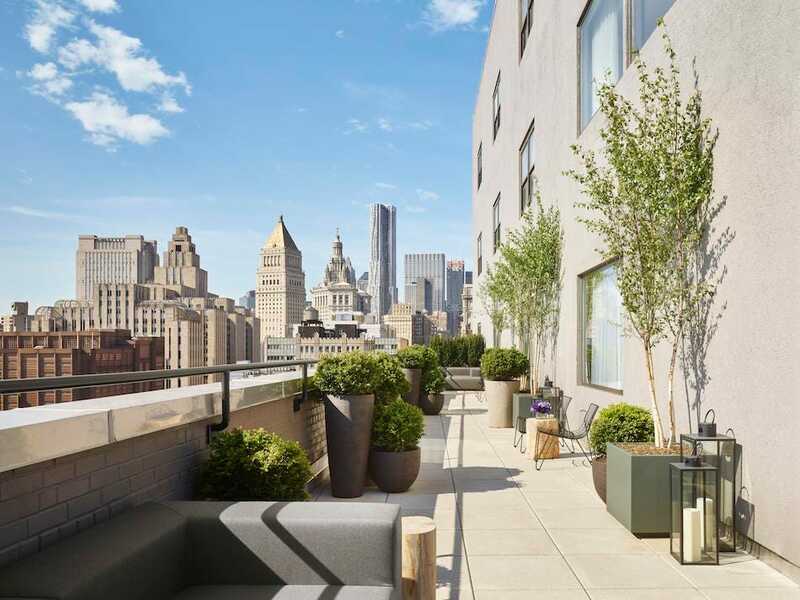 11 Howard doesn’t have a traditional lobby because of Soho zoning regulations that don’t allow more than 1,000 square feet of hotel function on the ground floor. So they’ve eliminated the traditional check-in desk and added a fantastic mobile by Alexander Calder suspended from the 15 foot ceiling that apparently the late artist’s daughter helped to select for the spot. Art is a key component throughout in the guest rooms and common areas. 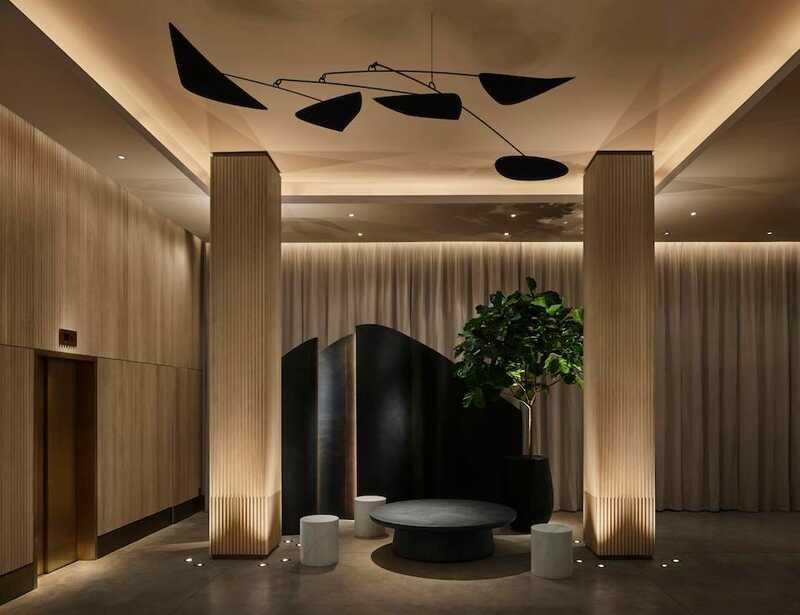 Taiwanese lawyer-turned-artist Katie Yang created ceramic wall sculptures for the 213 guest rooms, positioning each one herself. And the hotel’s co-working space, the Library, where breakfast is also served, displays the work of photographer Hiroshi Sugimoto. Painter/sculptor Dan Attoe contributed a mixed-media piece incorporating neon and animation that is mounted to the ceiling above the spiral staircase. In the event space which often features pop-ups with local businesses, English artist and fashion designer Holly Fowler hand-painted two murals on silk. Most of the guest rooms are fairly petite, no surprise for New York, with the exception of the Terrace suite with its generous interiors and impressive lengthy outdoor space. 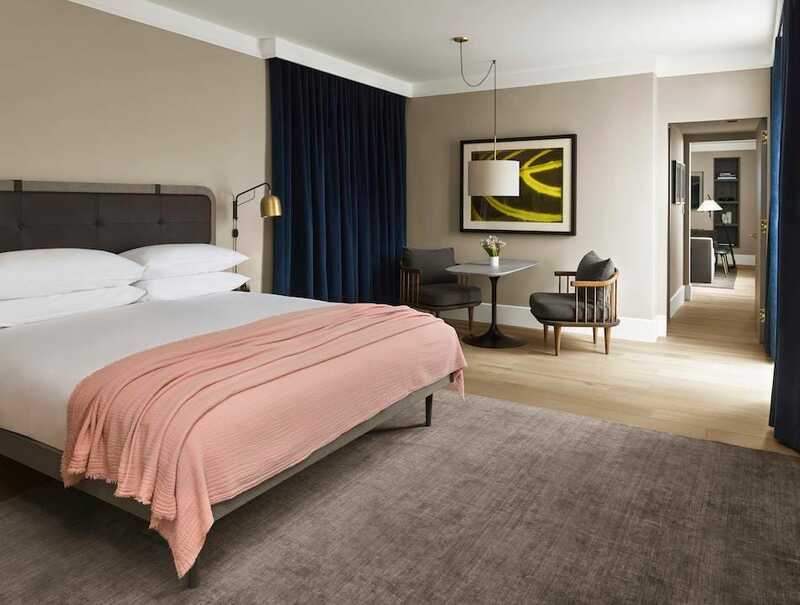 The high ceilinged guest rooms all feature light oak, wide-planked floors, bronze light fittings, custom-crafted mid-century style furniture, as well as natural bamboo area rugs, navy curtains and dusky pink wool bed throws. Bathrooms, with marble and brass, are stocked with organic bath products. 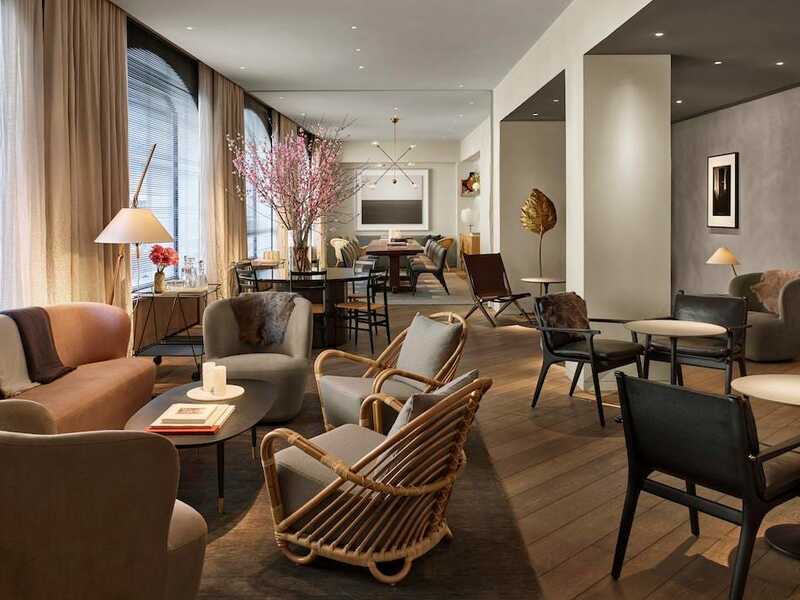 11 Howard has fast established itself as a dining destination thanks to the saavy collaboration of respected restaurateur Stephen Starr and internationally acclaimed chef Daniel Rose of popular Parisian restaurants Spring and La Bourse et La Vie. Together they’ve created Le Coucou, a restaurant offering classic French dishes like Coquilles St Jacques and Sole Veronique. Not long after opening, Le Coucou received the James Beard Best New Restaurant award in 2017. 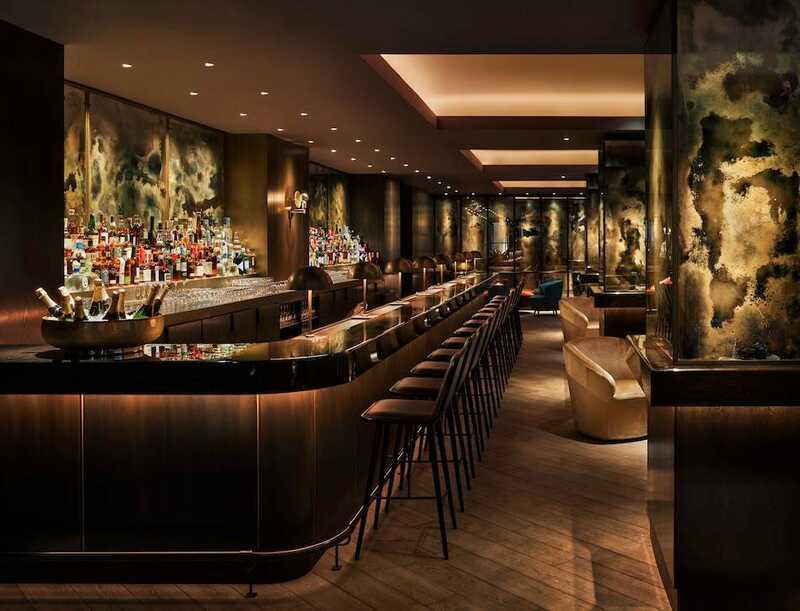 Before or after dinner, The Blond bar and lounge offers a great place for an aperitif or a nightcap. Dark wood, subdued colors and lighting, plus gold accents and bronze animal masks, provide an appealing setting. Gorgeous Danish design aside, 11 Howard should also be commended for its social conscience. Pop-up fashion and food initiatives in collaboration with local businesses are regular events and the hotel donates four percent from every room booked to the Global Poverty Project, a citizens’ movement working to end extreme poverty by 2030. On the hotel’s outside wall, there’s a large mural that was painted under the direction of Groundswell, a social public art initiative that works with economically disadvantaged young people. 11 Howard is ideally located in the heart of Soho with an abundance of excellent shops, galleries, bars and restaurants nearby. Shops like Opening Ceremony and Reformation are on the doorstep, along with restaurants such as Balthazar and La Esquina and other popular neighborhoods like Tribeca, The Bowery and the East Village are within easy walking distance.